(Photo courtesy of CrossFit) Greg Glassman instructing at the original CrossFit gym in Soquel, Calif., in the early to mid 2000's during one of the first CrossFit Level One courses. Washington • On a bright November morning, Congressman Scott Taylor is meeting with a visitor at his Capitol Hill office. Even in his dark suit and striped tie, the steely eyed, fit Republican from eastern Virginia looks every bit the Navy SEAL he once was. His visitor — Greg Glassman, founder and sole owner of CrossFit, a fitness company famous for its brutal full-body workouts — is older and dressed informally. He wears a ball cap over unruly ginger and gray locks, plus a three-day stubble, a flannel shirt, faded jeans and sneakers. Taylor tells Glassman that his first CrossFit workout, way back in the early days, was in the garage of a fellow SEAL who is now a top CrossFit staffer. Taylor wants to talk about other friends he has in common with Glassman, other SEALs who are CrossFitters. For Glassman, his visit to Taylor and his denunciation of the National Strength and Conditioning Association (NSCA) are part of a very specific agenda: He is at war with America’s soda industry, which he accuses of corrupting the science around sugar while acting as an enemy to the general health of the country. The NSCA — which licenses physical trainers and is thus something of a competitor to CrossFit — was the starting point for his crusade, as well as its original target: The group publishes a journal that, several years ago, featured a study with a negative statistic about CrossFit injury rates; Glassman in turn discovered that the NSCA was partly funded by soda industry money. His indignation over this has now spiraled into a full-fledged war against Big Soda. Three hours later, Glassman and his six-person posse — made up of some of his top staffers and a lobbyist — are a half-mile away, visiting Jim McCleskey, who represents the interests of North Carolina Gov. Roy Cooper, D, in Washington. Glassman is talking about legislation that has worked its way through the state’s assembly. It’s arcane and complicated, something about the licensing of dietitians and nutritionists. Again, Glassman — determined, dogged, methodical — follows the story back to the influence of his competitors and, looming behind it all, Big Soda. “What they can’t win with their bad physiology and their soda sponsorship, they’re trying to do with legislation,” Glassman says. Glassman, too, is holding nothing back. And with 3 million followers on Facebook, 2.4 million on Instagram and nearly a million on Twitter, not to mention about 14,000 affiliated gyms around the world, CrossFit has given him a massive preexisting soapbox — albeit a highly unconventional one for a policy crusade. Glassman later competed as a gymnast at Pasadena City College, one of several colleges and junior colleges he attended. (He never completed his bachelor’s degree.) He was hampered somewhat by leg injuries from an early bout with polio, and by broken bones from hard dismounts that today have left him with a limp. He then became a physical trainer, and by 1998, he was teaching classes at Spa Fitness Center in Santa Cruz. One of the members, Eva Twardokens, a former Olympic Alpine skier, says she became “hooked” on his CrossFit-style workouts — which were more akin to throwing hay bales and jumping over fences than they were to leg extensions or curls in exercise machines. After leaving Spa, he rented a spartan space in a jujitsu studio. A small cadre of athletes, including Twardokens, followed him. He launched CrossFit as a business in 2000, with his then-wife, Lauren Jenai. (The couple have four children. Glassman bought her out of the business after she filed for divorce in 2009.) The company really took off, he says, when they started posting “The Workout of the Day” online. “I had 30 clients, and I was busy full time,” Glassman says. “You aren’t going to start a revolution with 30 people, you really won’t. 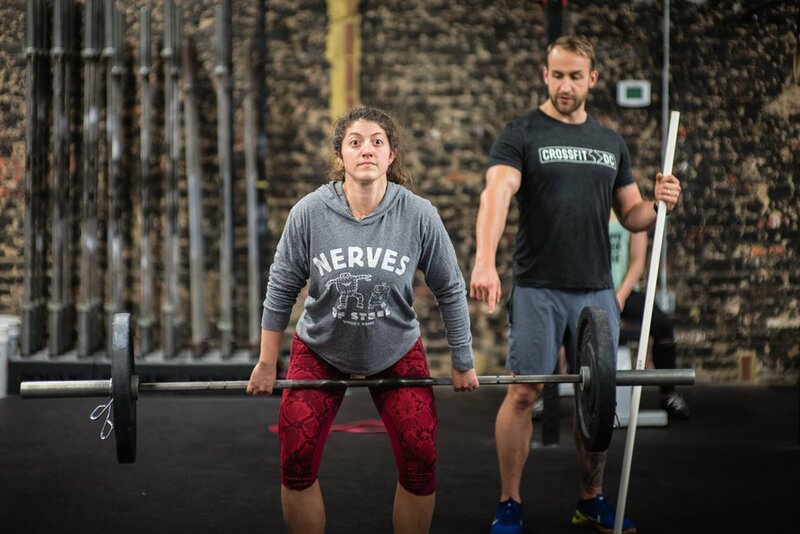 But we gave these workouts to the Net, and they came around.” In 2007, CrossFit held its first CrossFit Games, where men and women compete for the titles of fittest man and woman on earth. By early 2008, the Globe and Mail reported, there were 350 affiliated gyms — or “boxes” — worldwide. (Andre Chung | The Washington Post) Tyler Downing, who has been doing Crossfit for four years, works out at Crossfit DC. The study that set Glassman off on his quixotic campaign was published in 2013 in the National Strength and Conditioning Association-owned Journal of Strength and Conditioning Research. Although the study found aerobic and body composition improvements among CrossFitters, it also suggested there was a high rate of injury. CrossFit filed a federal lawsuit against the NSCA over the paper, claiming the group intentionally published false information about CrossFit to protect its training certification business. The NSCA then filed a state lawsuit against CrossFit, Glassman, Greene and Berger in California, alleging “false and disparaging statements.” Both cases are making their way through the courts. Although the soda companies were not going after CrossFit directly, their role in funding scientific research seemed wrong to Glassman. In early 2014, he posted on a CrossFit message board, “It’s time to drive Big Soda out of fitness and by extension, the health sciences.” As a long-term advocate of low-carb diets, Glassman was no fan of sodas, and he was outraged on principle. That year, he also dropped in on a conference of the American College of Sports Medicine in San Diego, near one of his homes. The ACSM is another of the mainstream exercise science groups that certifies physical trainers, and it, too, is viewed by CrossFit as a competitor. Coca-Cola was a founding partner of its signature program, Exercise Is Medicine, which emphasizes activity over diet. At the 2015 conference, James Hill, an obesity expert at the University of Colorado, delivered the keynote speech on a new nonprofit initiative: the Global Energy Balance Network. The network was pitching the message that consumers need not worry so much about what they are eating and instead should focus on staying active enough to burn those calories. Don’t look at the soda in your hand, the campaign suggested; look at your own sluggish lifestyle. Glassman’s was the first public criticism of the network, but it’s hard to say what effect it had. His missive was only retweeted 14 times, and others in the nutrition community were making the same point. Either way, though, his hunch was correct: In a front-page scoop that appeared a few weeks after his tweet, The New York Times reported that the Global Energy Balance Network was, in fact, rooted in $1.5 million of undisclosed funding from Coca-Cola. Glassman has also criticized the sugary sports drink Gatorade, which is owned by PepsiCo. (He often cites South African scientist Tim Noakes, and his book “Waterlogged: The Serious Problem of Overhydration in Endurance Sports,” as an influence.) He even convened a 2015 symposium to reconsider the hydration guidelines Gatorade has promoted. Overhydration can cause hyponatremia — when excessive fluid intake makes blood sodium levels drop dangerously low. In rare cases, it can be fatal. (Andre Chung | The Washington Post) Instructor Tess Candell demonstrates technique as instructor Thom Szymanski explains. As Glassman came toview the soda companies as enemies, he began to pitch CrossFit as more than a killer workout; it was “the answer” to chronic conditions such as high blood pressure, heart disease and Type 2 diabetes. 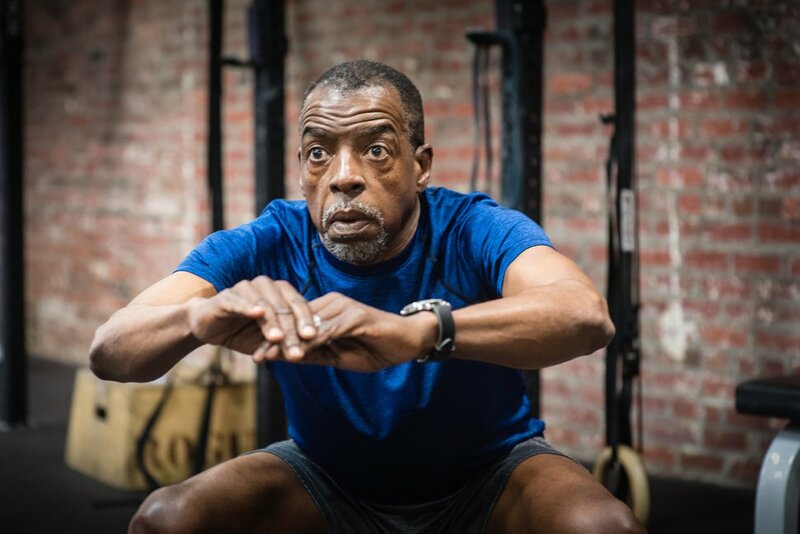 “I see each of my 14,500 gyms as a lifeboat against a tsunami of chronic disease,” he told a group of doctors, nurses and nutrition researchers in Boston during a talk in December. He has sought to spread this message through the CrossFit community. On a brisk fall day, he attends the CrossFit annual summit in a conference center just west of Dallas. Inside, the halls are full of people in business-casual attire who look like typical Americans — a bit out of shape, more than a bit heavy. But interspersed among them are some supremely buff men and women, in shorts or tights, and T-shirts. 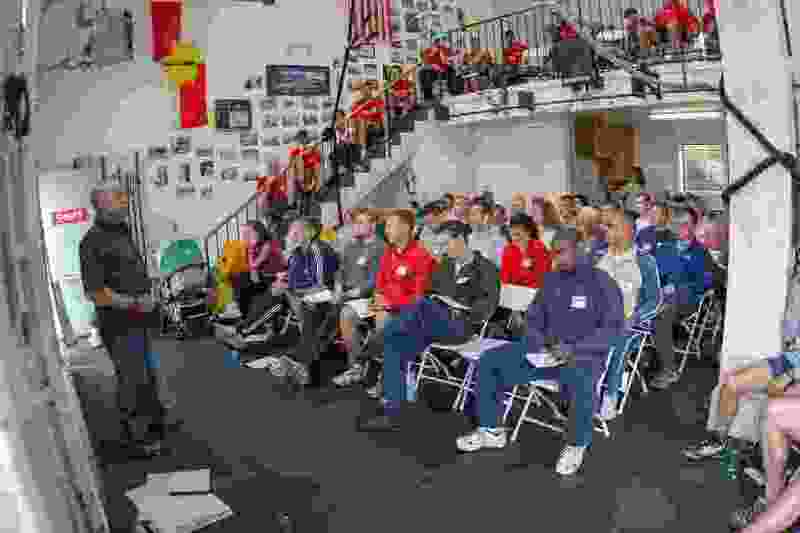 They are 140 of the top trainers from all over the world who play a critical role in the CrossFit organization. Here, Glassman starts to ramble a bit. He mentions the evils of sugar. He talks about the replication crisis, where researchers are unable to replicate results for long-accepted studies. Soon, he’s talking about the “science wars” and holding forth on the scientific method. For a second, it seems that he risks losing the crowd. On the whole, though, the audience of CrossFit faithful seems to take what he says at face value. The tougher question may be whether Glassman — as he barnstorms across the country speaking to doctors, researchers and lawmakers — is managing to influence the discussion about health and soda outside the CrossFit community. “His clientele is obviously paying attention,” says Robert Lustig, a pediatrics professor at the University of California at San Francisco. “The rank and file of America are not listening, because they are kind of sugar-addicted.” The author of “Fat Chance: Beating the Odds Against Sugar, Processed Food, Obesity, and Disease” and “The Hacking of the American Mind: The Science Behind the Corporate Takeover of Our Bodies and Brains,” Lustig shares Glassman’s zeal for increasing physical activity and reducing refined carbohydrates. Dietz says most discussion about chronic disease and soda is now focused on soda taxes — like those that have reduced soda consumption in Berkeley, California, Philadelphia and Mexico. But as a libertarian, Glassman does not favor soda taxes, so he is on the sidelines of that conversation. Glassman does, however, want warning labels on soda cans, and he backed a failed California bill to require them. He set up a website and toured California CrossFit gyms to stump for the bill, encouraging members to contact their legislators. In another of his policy pushes, he has asked lawmakers to strengthen conflict-of-interest guidelines at the CDC and NIH. (Andre Chung | The Washington Post) Lewis Dawkins, who has been doing Crossfit for 7 months, works out at Crossfit DC. He likes it because for the price of membership you get the instructors and the classes, and compares it favorably to paying for a personal trainer at other gyms. Then he and his crew discuss logistics for the next day’s trip to Oklahoma, where Glassman will spend a few days visiting CrossFit boxes on a Choctaw reservation, and talking about fighting Type 2 diabetes and other illnesses among Native Americans. The following morning, their modest caravan of two SUVs travels north over the prairie, into the heart of America. Carpenter is the author of “Caffeinated: How Our Daily Habit Helps, Hurts, and Hooks Us.” He is writing a book about soft drinks and health.